New to Viewer? Use this guide to learn everything about Viewer from signing on to accessing all the features. After you log in for the first time, you will receive an email to verify your registration. 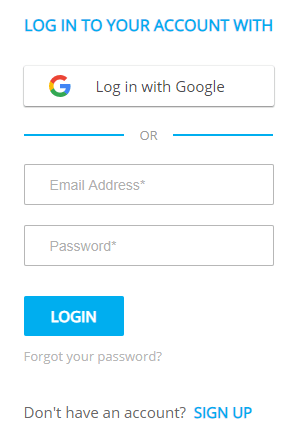 If you forget your password, click on Forgot Your Password? If you do not have an account, click SIGN UP at the bottom of the page and register with your company email address. Enter as many companies as you want to start your portfolio. You can always add or remove companies at any point. Amenity Analytics covers thousands of companies with published earnings reports in the English language. Amenity Analytics partners with leading data providers like S&P Global Market Intelligence and FactSet for transcript access. The timing of when Amenity Analytics receives the transcript can vary, but typically we will have transcripts in Viewer within 3-5 hours of the end of the call. The Amenity Score is a weighted score ranging between -100 and 100. Positive events will increase the score while negative events will lower the score. 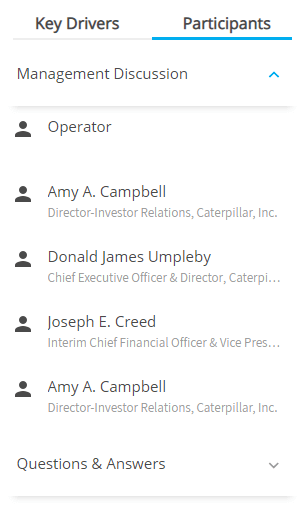 Clicking on a company row will expand it to show a summary of the top 5 Key Drivers that Viewer detected in the transcript. In the example below the chart on the right is a four-quarter historical trend in the Amenity Score. The links correspond to the company's recent 4 transcripts. 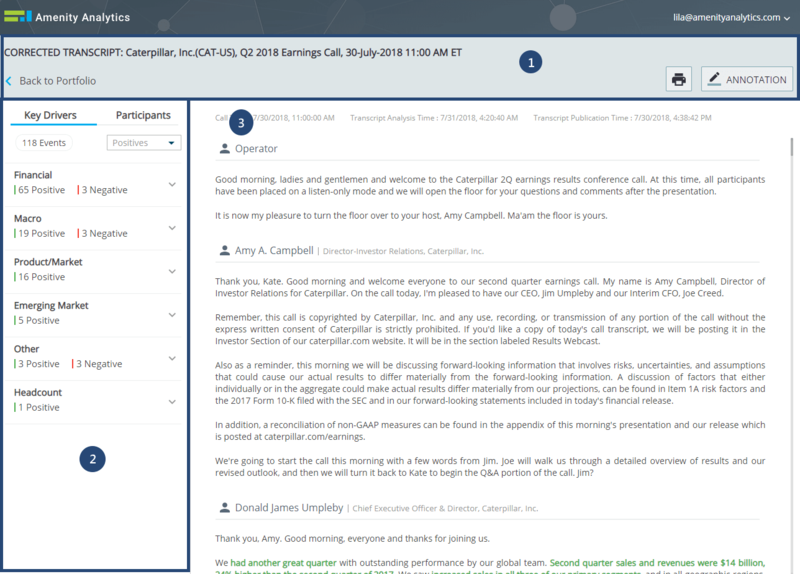 The heading displays the title of the transcript which lists the version of the document, the ticker, region and company name as well as the event date in EST timezone. The document version is dependant on our data providers (See: 3. Viewing the Latest Transcripts). You have the option to print the transcript using by selecting the Print button (See: 8. Printing a Transcript). You also have the option to annotate the transcript by selecting the Annotation button (See: 7. Annotations). The navigation contains two tabs: Key Drivers and Participants. Key Drivers: Viewer highlights extractions and groups them into Key Driver categories. This allows you to quickly navigate the document by selecting categories of extractions to view in detail within the transcript. 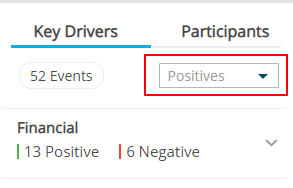 Use the drop down menu to sort events by number of Positives, Negatives, Total Events, and Positives-Negatives. Participants: Viewer groups all the speakers by call topic. Selecting a participant will navigate the document to the relevant section in the transcript. Hovering over the highlighted text allows you to view the corresponding event type. There are cases where you may find text that you feel should be highlighted, but is not yet detected by Viewer. You can customize Viewer's model to include similar texts in the future and add the appropriate highlight by adding an annotation. Likewise, you can change your annotation or an existing highlight by hovering on a highlight and selecting Edit or Unmark. Again, any changes will only be visible to you. 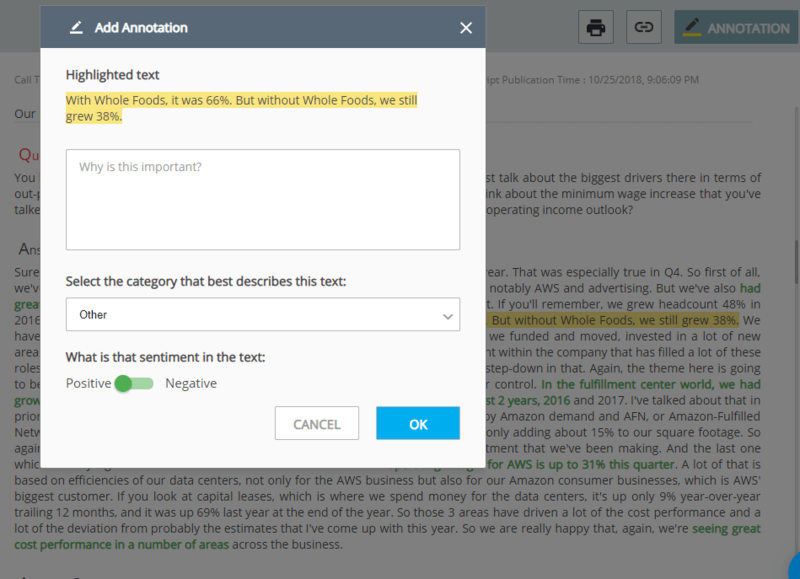 A notification of any annotation or highlight change is sent to Amenity Analytics. Please Note: Selecting Letter/A4 will match the highlights appropriately on your printout. If the highlights are not aligned to the page, make sure your printer settings match your paper size selection. 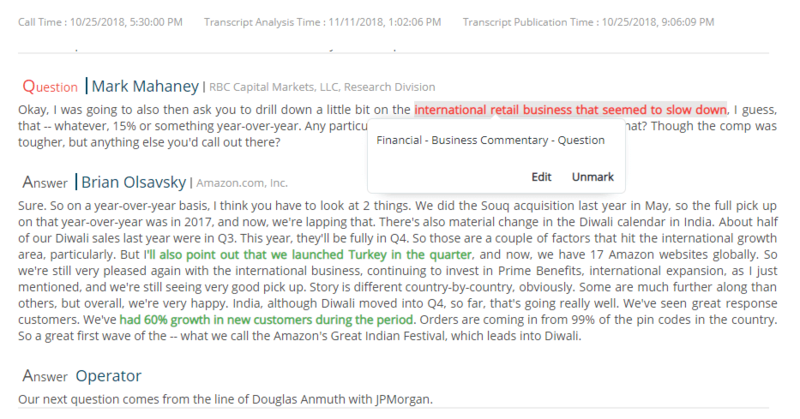 Query Inisghts allows you to search on highlights made by Viewer across all analyzed transcripts. 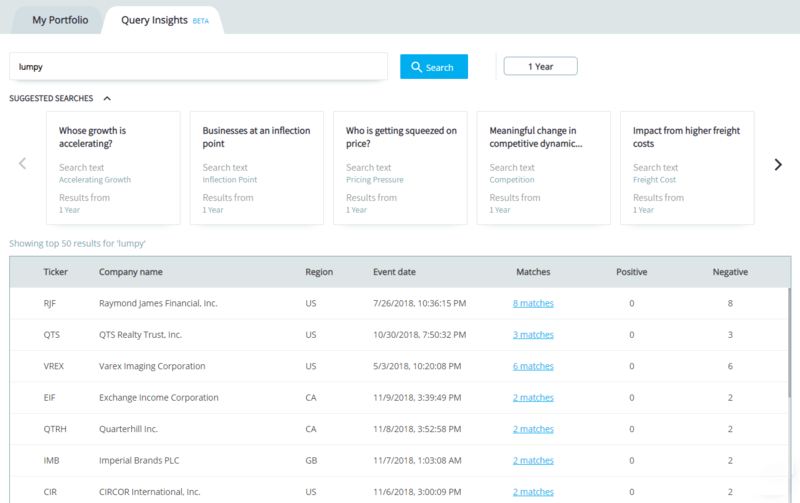 Using the search feature can help you find how market trends and events affect different companies. Query Insighst is currently in Beta, and shows only the top 50 results as ranked by Viewer. Amenity Analytics selects the top market trends on a weekly basis, and adds them to the suggested searches at the top of the Query Insights page. 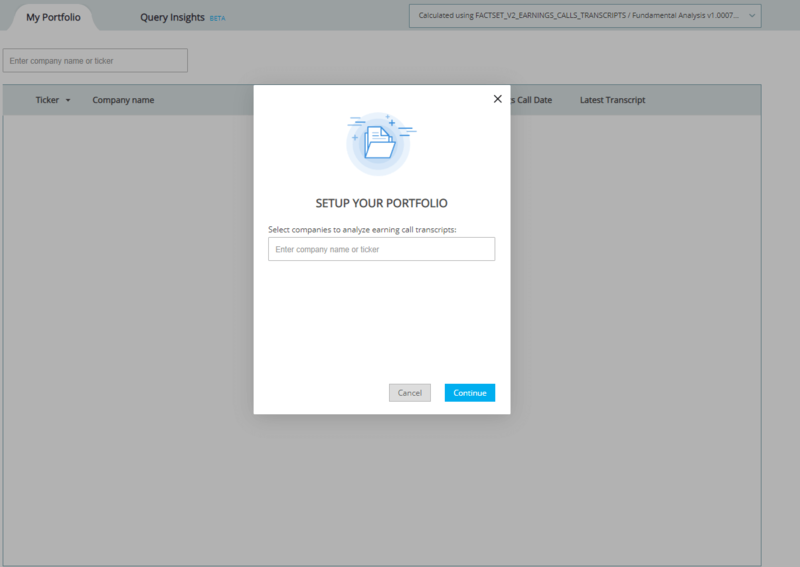 Query insights is covered in detail in our Using Query Insights page.